Very rare reception: VDOT Highway Advisory Radio, 1680 kHz. 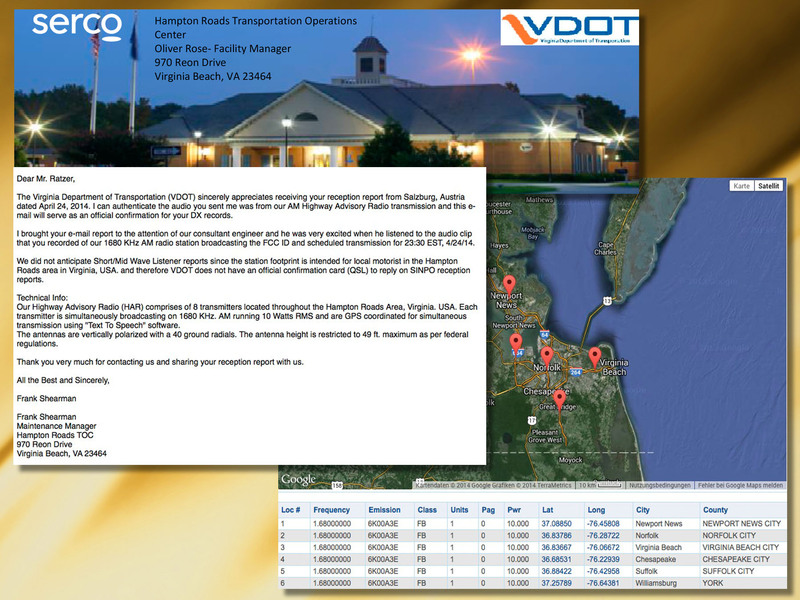 Virginia Department of Transportation (VDOT) Highway Advisory Radio (HAR) comprises of 8 transmitters located throughout the Hampton Roads Area, Virginia. USA. Each transmitter is simultaneously broadcasting on 1680 kHz. AM running 10 Watts RMS and are GPS coordinated for simultaneous transmission using “Text To Speech” software. The antennas are vertically polarized with a 40 ground radials. The antenna height is restricted to 49 ft. maximum as per federal regulations. Possible the first reception of this low power TIS station in Europe. Many thanks to Frank Shearman, Maintenance Manager for this verification. Reception: 25.4.2014, 03.29 UT, Winradio Excalibur PRO/CSO, Beverage 250 mt.